CNN is significantly expanding its digital operations with a variety of unique online video tools. They include live-streaming TV to multiple devices (TV Everywhere), video commenting for online articles, and a new iReporter upgrade that integrates amateur and professional reports. The upgrades are due to start rolling out this summer. To access the stream, users will need a television subscription to Comcast, Xfinity, Dish, Cox, or Verizon FIOS–the new initiative arrives at the same time Time Warner Cable launched its own iPad app, allowing users to watch 32 live channels on the tablet. CNN has promised virtually indistinguishable quality between mobile and TV-streamed content (picture below), and from what Fast Company was shown during a live SXSW demo, the quality will likely satisfy most consumers. Additionally, users will be able to sync their viewing between devices. For instance, users can stop watching video on their iPad as they get off the train from their daily commute and resume, at the same time in the video, on their TV at home. The video commenting system is interlaced with regular text comments in the online articles. The entire recording process is Web-based, automatically detecting the computer’s recording device (such as a webcam). After the video is captured, users are given the opportunity to preview, cancel, or submit the video. In all, the process looks like it takes as little at 20 seconds. The consequences of video may have significant impact on the behavior and tone of commenting. Without the air of anonymity, will some commenters be as vicious? If users are given a filter to only see video comments, it might be clunky, but effective way to manually cut out all of the anonymous, aggressive comment trolls. Recent events in the Middle East convinced CNN executives that the video captured from both amateur and professional reporters is an essential to covering an unfolding crises. On the other hand, CNN wanted to be sensitive to criticisms from some users that only wanted to see reports from professional staff. The solution was Open Story, a platform that interlaces iReports and (clearly labeled) professional reports. 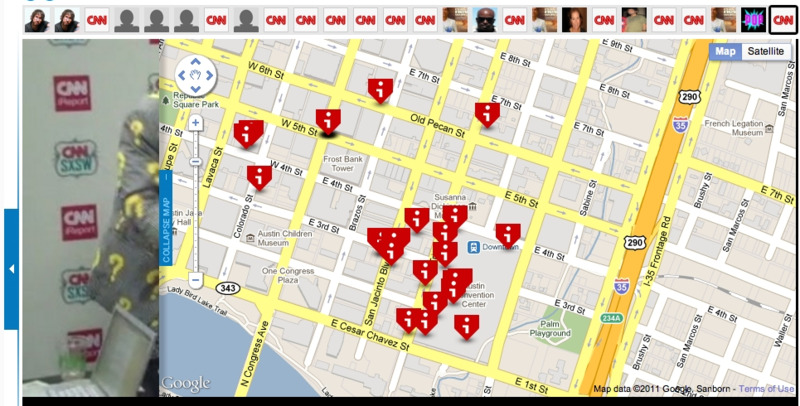 Finally, a highlight reel of CNN.com’s SXSW press conference, hosted by CNN Digital General Manager KC Estenson. Follow @fastcompany on Twitter; see full coverage from SXSW.